Yesterday's post almost drove me crazy because I had bare lips in every picture - my cracking, peeling, tri-toned lips. The good of that is now I can show you how Le Metier de Beaute Les Artistes ($95) remedies that. 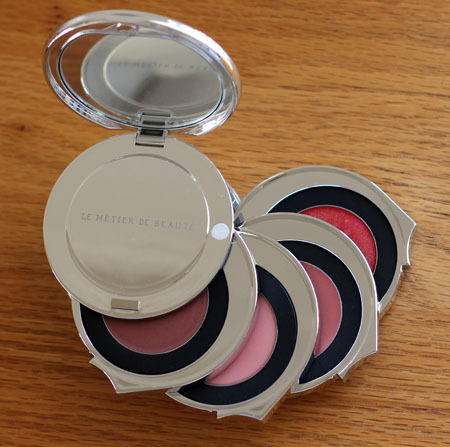 Les Artistes is part of Le Metier de Beaute's Fall 2010 collection. 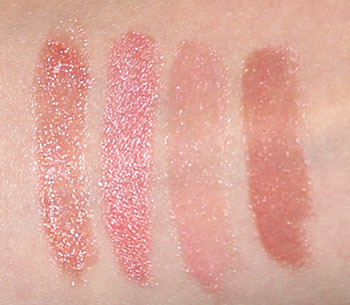 It is a four-pan lip kaleidoscope that utilizes the same layering technique as their eye kaleidoscopes, but instead of beginning from the top, you start from the bottom and work your way up. Les Artistes is a high shine palette. Every layer imparts just a little color on the lips and proceeds to give you multi-dimensional shine. If you look closely at the lip swatch, you can see flecks of all four colors peeking out from different parts of the lips. Les Artistes does not have lip plumping properties, but see how full my lips look after application! One thing I like to point out about Les Artistes is texturally, the four colors aren't the same. 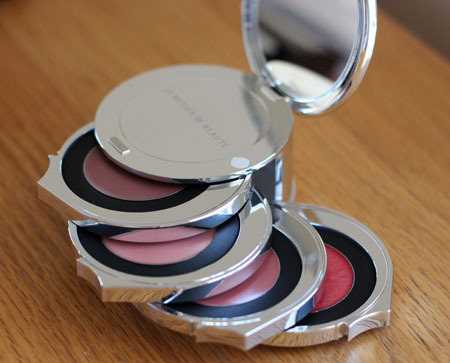 The bottom two feel thinner, feature some tackiness, and are more pigmented compared the top two layers, which feel less sticky, milkier and sheerer. Le Metier de Beaute lip kaleidoscopes have a strong (burnt?) vanilla smell, similar to their lip cremes. The average weartime I get from their lighter-hued lip kaleidoscopes is 4-5 hours. I had a little fun with my sartorial choices yesterday. I found this dress at Free People and had to have it. When I was a wee little girl one of the things I wanted was a fairy dress (I had ones with laces and frills, by all accounts my princess fantasies were fulfilled, but the fairy ones...). I wanted to flutter as I walked, but I couldn't find one and forgot about it. Years later, when The Fellowship of The Ring first hit theaters, Cate Blanchett/Galadriel comes into view wearing the exact incarnation of my dream dress and since then that desire resurrected. This isn't the maxi glory of my dreams, but the fluttering comes pretty close! As mentioned yesterday, Le Metier de Beaute recently launched a facebook app that tracks down kaleidoscopes of yore. If Les Artistes piques your interest, you're in luck! 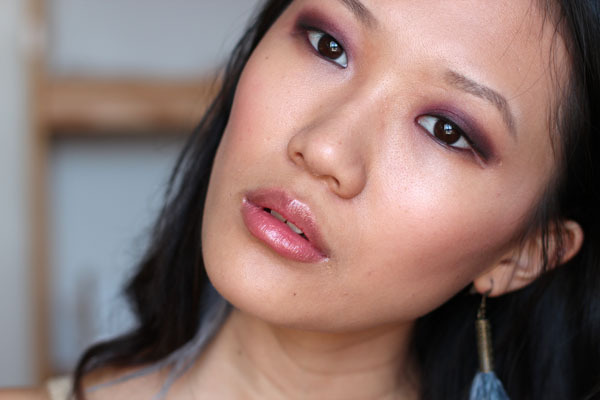 Mmph, that palette is absolutely gorgeous! To be honest, I wouldn't have the patience to layer on four lip products when I could just use one, but the results *are* pretty fabulous. Hope your weekend's going well! :o) Love the fairy dress, too. @Rae I agree, it's not a slap on and rush to work kind of palette. I play with it on weekends or when i have time for precision. @luv2smilexo thank you :) love that you just posted about Ecumes D'or! @Serena.D my pleasure! and thank you for your kind words! I love that dress! I also would not have the patience to apply four lip layers, but it does look very beautiful! I love your eye look in this post! And the dress is awesome. I love my LMdB stuff - that said, I don't use this palette that often. I simply don't have time in the morning to layer four colors and usually don't like to bring my kaleidoscopes around in case I break them. I'm happy I have it in my stash, definitely, and I pull it out to use during special occasions. But if what you want is to get more (or easier) use out of a product, I'd suggest a lip creme instead :) I hope I answered your question!